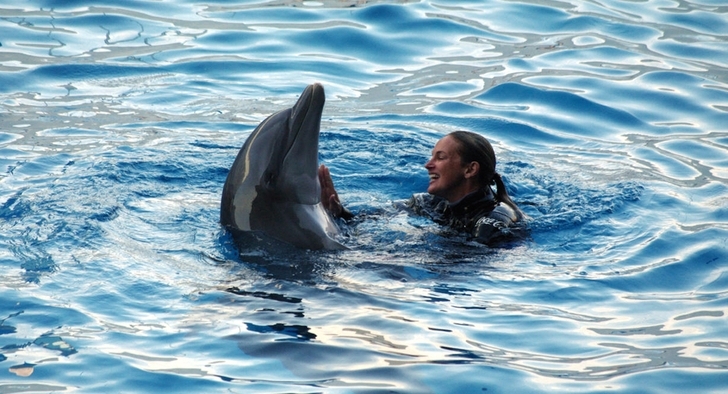 Last year, I connected with a dolphin trainer called Ashley Guidry, from Gulf World in Florida. Over the more than 10 years she worked with Gulf World’s dolphins she had come to find her love of the animals irreconcilable with the business of using them for profit-making entertainment. I have always been interested in how trainers’ attitudes change over time, as they learn all the subtleties of the marine park business, and also develop deep bonds with intelligent, captive beings. Many trainers say “I love my animals” as a way of suggesting that the animals are doing fine in captivity; that their “love” means that everything is fine (because it would prevent them from condoning or tolerating practices that harm the animals). However, I have long thought that what many trainers mean when they say “I love the animals” is really “I love working with the animals” or “I love having a deep relationship with the animals.” In other words, that being a trainer is about themselves and their desires, and not really about the animals and the animals’ welfare. But Ashley Guidry provided an example of what truly loving the animals means: by walking away from a business that treats them like commodities, and telling the story. That takes guts and self-sacrifice. And real courage. This a story about empathy, about it’s power to connect us to animals, but also to suddenly change the way we think about animals and our relationships with them. It’s also the story of a stubborn, sassy, blonde named Ashley Guidry, and how her love and compassion for a dolphin calf turned her life, her career, and her view of herself completely upside down. Because it was empathy–and her undeniable compulsion to try and consider the world from the point of view of a little guy named Chopper–that unexpectedly dumped her into a morass of introspection, self-doubt, and painful self-discovery. In the end, Chopper changed her life for the very simple reason that she couldn’t change his. Read the full story of Ashley Guidry’s change of heart here. Thanks so much for writing this article documenting a dolphin trainer’s journey in her career and her soul. It’s both heart-breaking and heart-warming to read these stories. Hopefully one day humanity would choose the right thing to do for themselves.